A label is certainly a constraint, but when it is made intelligent, it turns into an asset. A smart label can have several functions. It can be used to authenticate, to secure, to identify and to trace your product. We can provide labels that carry guarantee warnings, labels with open or tamper evidence, labels with temperature or sterilisation indicator. For example, a sterilisation indicating label will tell if autoclaved equipment has been sterilised or not. We develop our know-how to meet the requirements of our customer's project and we control all the technologies necessary to make their Label unique in order to suit their needs. Polyethylene (PE): A synthetic and flexible material that offers good resistance to UV and ambient weather conditions, but does not resist heat. Its flexibility allows the use of flexible packaging. Polypropylene (PP): A synthetic and semi-flexible material with very good resistance to UV, ambient weather conditions, solvents and heat. It is more rigid and less sharable than PE, and therefore suitable for more constraint-demanding applications. Polyester (PET): Extremely resistant and relatively tough, PET provides very good resistance to UV, solvents, low and high temperatures, therefore suitable for harshcondition applications. Temporary (removable or repositionable) adhesives: A Label coated with an adhesive that has a final low adhesion force can be removed from the substrate and repositioned shortly after. 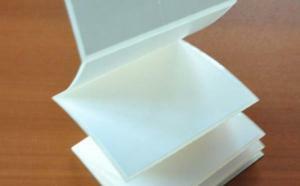 Permanent Adhesive: As it suggests, permanent adhesive will readily fix permanently on substrates. It is not intended to be removed. Reinforced adhesive: It is one used on harder surfaces such as steel, wood etc. It is resistant to solvents. Flat: The Label is completely printed in one colour. Gilding: A hot-printing technology where heated die is used to lay gold leaves or metallic pigments on a substrate. Hologram: A printed device inserted in or laid on valued objects such as credit cards, tickets, passports, software boxes and other items in order to reduce reproducibility. Their characteristics are difficult to replicate by counterfeiters. Scratch-off mask: A customized over-coat (of colours and patterns) on "pin" destined to hide information or numbering that will reappear after scratching the area with a sharp edge. Varnish: An additional layer of print to either gloss or matte finish a label. VOID: A method or device used primarily on security labels to seal product or package. When the label is removed, the VOID is set-off and a message appears confirming violation. The Label is said to be a VOID label or simply VOID evident when the removed Label transfers partially or totally both on the label and the product. The Label is said to be VOID non-transfer when the removed Label leaves no transfer on the product. Thermochromic ink: ink used to induce reaction to temperature changes in Labels. Individually customised Label: By thermal transfer printing, a Label may be customised using pin-code, bar code, an alphanumerical code, algorithm, invisible tracer, a logo, an image, a selected text, in one or more colours. Coating is applied on some product lines. It increases the life-span of a Label and also adds value to the product by its tint thereafter. The coating can either be glossy or matte. The glossy coating enhances colours, making them more vivid and emphasis contrasts. The matt coating, presently trendy, gives the label a soft satiny touch, a sober and elegant distinction. 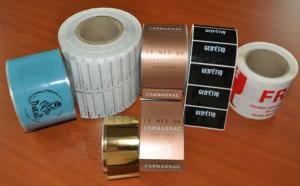 Labels are cut with dies positioned on the machine cylinder. The cut can be through-cut (front-to-back) or half-cut (cut to glue). 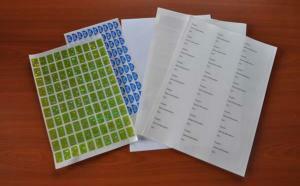 During manufacturing, the half-cut isolates the Label on the silicone substrate. The edges are then removed by weeding. The weeded Label is the standard Label per say. When Labels are customised, the weeds serve as references to position them and thus to stall for printing. The continuous cutting: Label is not cut, the substrate being a continuous strip. One side of it is ripped, so as to easily detach it. 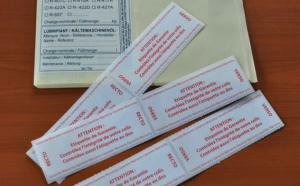 The spot: if the Label or the release liner is transparent, a thermal transfer printer will be unable to detect weeds. Therefore, it is necessary to print black spots on the back to allow the printer detect the position of the Label and to stall for printing. Cuts: we effect all possible shapes of cuts. Every one requires a specific tool. Pre-cut: can be between Labels to facilitate detaching one from another or inside the Label itself to put it apart. Packing is done to your specifications.